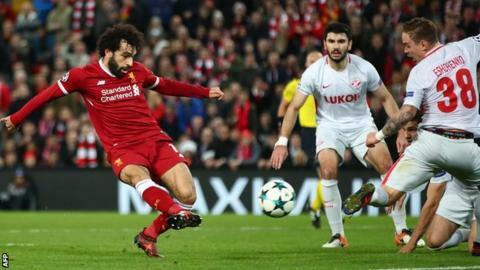 Britain's seven teams in the Champions League and Europa League will discover their knockout stage opponents when the draws are made on Monday from 11:00 GMT in Nyon, Switzerland. A record five English teams are in the Champions League last-16 round. Tottenham, Manchester City, Manchester United and Liverpool all won their groups, with Chelsea finishing second in theirs. Arsenal and Celtic's Europa League last-32 draw is at 12:00 GMT. Clubs finishing top of their Champions League groups will be seeded and drawn against a second-placed team in the last 16. Teams from the same country, or from the same group, cannot face each other. However, finishing first does not guarantee an easier tie in the next phase as Manchester United, Liverpool and Manchester City could all face one of Bayern Munich, Juventus or Real Madrid. Tottenham could get Bayern or Juventus, but not Real, having been in the same group. Chelsea will be hoping they get drawn against Besiktas, otherwise they will play either Paris St-Germain or Barcelona. Arsenal won their Europa League group - ensuring they will play either a team who finished second in a group, or any of the four worst teams to finish third in a Champions League group. They could face Celtic, Borussia Dortmund or Napoli. Celtic will face one of the Europa League group winners - or one of the best four teams to drop out of the Champions League. Manchester United (Group A winners): Bayern Munich, Juventus, Sevilla, Shakhtar Donetsk, Porto or Real Madrid. Chelsea (Group C runners-up): Paris St-Germain, Barcelona or Besiktas. Liverpool (Group E winners): Basel, Bayern Munich, Juventus, Shakhtar Donetsk, Porto or Real Madrid. Manchester City (Group F winners): Basel, Bayern Munich, Juventus, Sevilla, Porto or Real Madrid. Tottenham (Group H winners): Basel, Bayern Munich, Juventus, Shakhtar Donetsk or Porto. Arsenal (Europa League): AEK Athens, Astana, Celtic, Borussia Dortmund, Steaua Bucharest, FC Copenhagen, Ludogorets, Lyon, Marseille, Napoli, Nice, Ostersund, Partizan Belgrade, Real Sociedad or Spartak Moscow. Celtic (Europa League): AC Milan, Arsenal, Atalanta, Athletic Bilbao, Atletico Madrid, Braga, CSKA Moscow, Dynamo Kiev, Lazio, RB Leipzig, Lokomotiv Moscow, Plzen, Red Bull Salzburg, Sporting Lisbon, Villarreal, Zenit St Petersburg. The Champions League draw will take place at Uefa headquarters in Nyon, Switzerland on Monday, 11 December. The draw is set to start at 11:00 GMT, with the Europa League draw immediately afterwards at 12:00 GMT.